Welcome to the all things Coffee Lake & Skylake X Refresh Megathread!!! This thread will serve as the primary discussion thread for all things regarding Coffee Lake. We’ll be updating as we gain more information. Coffee Lake marks the third evolution in Intel’s series of skylake based CPUs. The first was Skylake, Intel’s first x86 architecture based on the 14nm process, Skylake improved several characteristics of previous architectures, including heat generation, power consumption and more IPC, allowing Skylake to be the most efficient and most powerful CPUs on the market during that time. The next evolution was Kaby Lake; launched in 2016, Kaby Lake was based on a further optimization of the Skylake architecture, namely the 14nm+ process, this enabled Kaby Lake to push clock speeds well beyond the 4.5-4.7GHz barrier that most CPUs couldn’t surpass without noticeable CPU degradation. Now, we have the latest improvement of the Skylake architecture; Coffee Lake. According to rumors, Coffee Lake is on an optimization known as the 14nm++ process, presumably this is simply another optimization like Kaby Lake to improve CPU clock speeds. Backing up this rumor are several other rumors stating that Core i7 8700K’s are topping out at speeds of 5.3GHz. Of course, we will have to wait for the official reviews of the 8700k to see whether these rumors hold value or not. What we do know for certain is that Intel is increasing core counts across the board on its new 8th Gen Coffee Lake CPUs. Core i3s are now full quad cores, and Core i5s and I7s are now equipped with 6 cores. This marks the first time we’ve seen a complete core count increase across all CPUs from Intel since the Core 2 series. Fortunately for AMD, Ryzen still has a thread count advantage over Intel, this alone still makes most Ryzen chips very competitive against Coffee Lake. What we should see according to specs alone is more of a tie between Ryzen and Coffee Lake when it comes to multithreaded applications and multitasking. Gaming wise, Intel will still take the lead as Intel apparently is still using the Ring Bus architecture for their 8th Gen. CPUs versus Intel’s new Mesh architecture which is implemented in Skylake-X. This means that core-to-core latency will be almost as fast as Kaby Lake, so gaming performance will not be hindered compared to AMD’s Infinity Fabric which generally has higher latencies due to cores needing to communicate across CCX’s. The only place the 7740X wins is in it’s base clock of 4.3ghz, but even then it’s negligible since the 8700K has a 4.7GHz boost clock while the 7740X only has a boost clock of 4.5GHz. So as you can see, Kaby Lake-X is completely dead after just several months from launch. Skylake-X could also take some hits but shouldn’t be as severe as Kaby Lake-X. The Core i7-7800X will most likely get punished by the 8700K as it has an identical core count to the 8700k, granted it does have quad channel memory support and has more PCI-E lanes than Coffee Lake CPUs, but it share a very similar latency deficit like Ryzen due to Intel’s new Mesh architecture. So if you're a gamer and a content creator, the 8700K most likely will be no brainer. Only those who need the extra PCI-E lanes and quad channel memory will buy the 7800X over the 8700k. We could also see the 7820X Octo Core CPU being eaten by the 8700K in the market if the 8700K’s higher clock speeds can make up enough performance for the price vs the 7820X. But we will have to wait for the benchmarks to see what will become of Skylake-X. I know all of you have seen the reviews on the i9 9900K by now, so i'll keep this brief. (According to wikichip) Coffee Lake R Uses the same exact 14nm++ architecture as the 8th Gen Coffee Lake CPUs, the only differences between the 8th gen and 9th gen SKUs are higher frequencies, more cores for the high end and the addition of a a soldered IHS (for improved thermal dissipation vs. older 8th Gen chips which uses thermal paste between the die and the IHS). The 9700K is probably the most surprising CPU out of the three SKUs launched this month, because for the first time ever on a Core i7, we have no hyperthreading. To counter that, the 9700K does have 8 cores instead of 6. But the lack of hyperthreading does hinder the 9700K vs it’s predecessor the 8700K. Both the 9700K and 8700K trade blows in benchmarks. Intel has also launched the new Z390 chipset for 9th gen processors (however they are still backwards compatible with Z370). Z390 is incredibly similar to Z370, with only a few things that make up the differences. 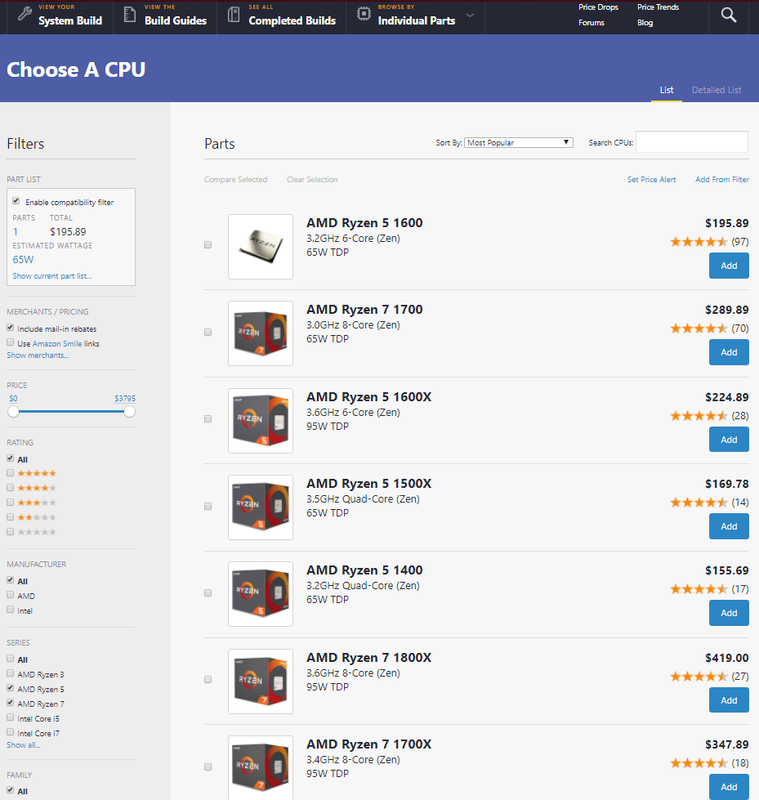 One is the power delivery, Z390 boards have beefier VRM systems compared to Z370, however it isn't a specification required by Intel (but it is a necessity nonetheless so the 8 core chips don't power throttle). What is a required specification by Intel are the updated connectivity features. USB 3.1 10Gbps is now natively supported and so is built in WiFi capability. Unfortunately Intel’s refresh of Skylake-X isn’t looking nearly as good as AMD’s refresh of Threadripper was (which to remind you, included DOUBLING the amount of cores going from 1st to 2nd gen). All we’re getting are slightly higher core frequencies, more cache for the low and midrange SKUs, and no more disabling of PCI-E lanes for low end X299 chips. Unfortunately, the above, is not true. 9th gen Skylake-X is still running on the same 14nm process as 7th gen.
Cache has also been improved for the 8,10 and 12 core parts. Now the 8 core chips get 16.5MB of L3 cach vs 11MB, 10 core variants get 16.5MB & 19.25MB (more on that later) of L3 vs 13.75MB, and 12 core chips get 19.25MB of L3 vs 16.5MB. Last but not least, the lowest end SKUs no longer get their PCI-E lanes cut. Every single X299 Skylake-X Refresh SKU now has 44 PCI-E lanes. This is huge as Intel in the past has almost always used PCI-E lanes to differentiate it’s higher and lower end HEDT parts. The biggest loss here is lack of more cores. Skylake-X Refresh has the same amount of cores as Skylake-X. They will now have to fight AMD on even harder turf as the Threadripper 2990WX has 32 cores while the 9980XE is still stuck at 18 cores. Twin 10 core SKUs: Yep you heard me right, the core i9-9820X and i9-2900X both pack 10 cores and 20 threads each. The difference between the two is very minor, the 2900X has a slightly higher core and boost frequency aswell as slightly higher cache (as mentioned above). The difference in price is $100 between the two. The Six Core HEDT SKU is gone. 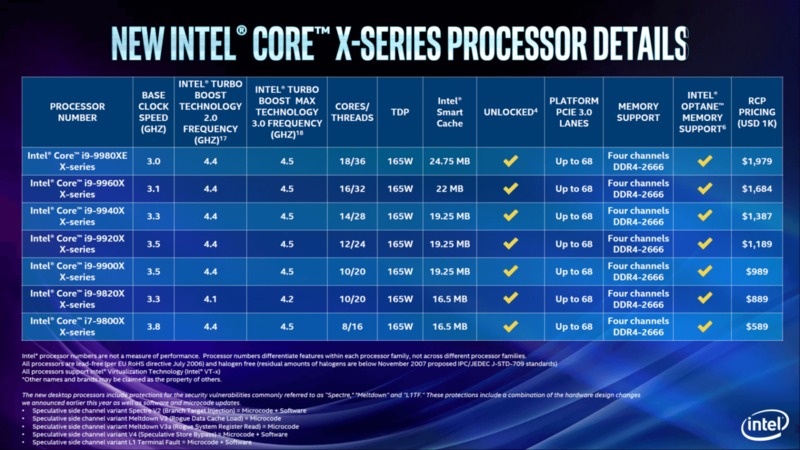 I think it’s pretty obvious why Intel no longer has a six core part for the X299 platform, given that 8 cores on the mainstream exist and six cores has now gone down to the Core i5 only. Core i7 STILL on HEDT: For some inexplicable reason, Intel has still given its lowest HEDT SKU the name of a core i7 (the i7-9800X). When core i9 exists on the mainstream, i have no clue as to why you would put a core i7 name on HEDT. 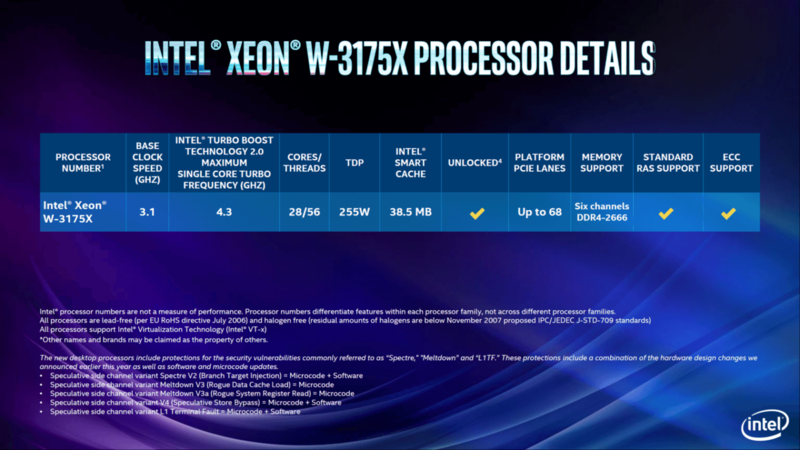 is basically an unlocked variant of the Xeon 8120 server processor. 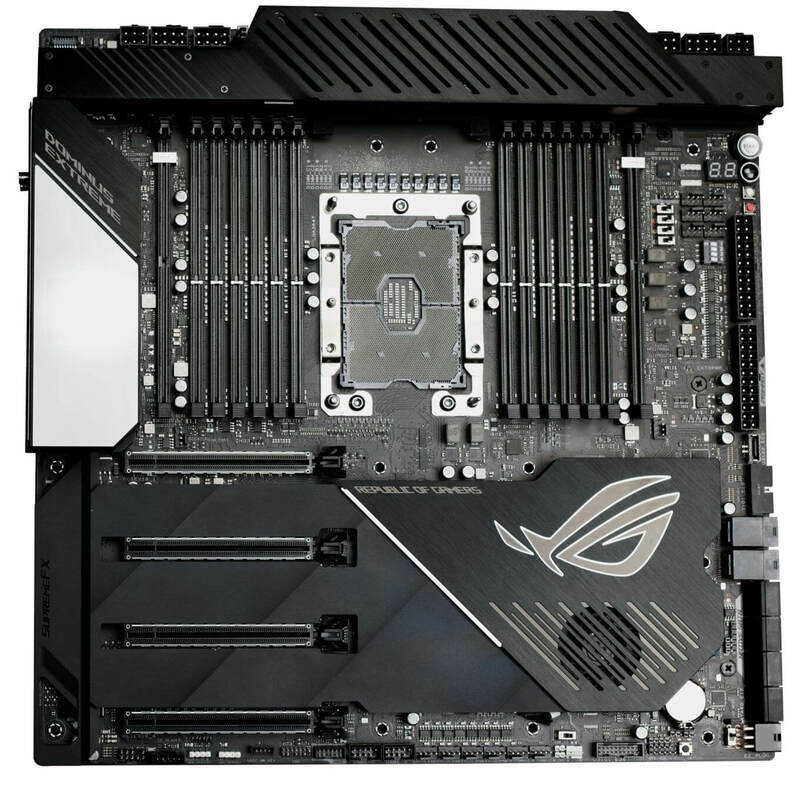 This CPU will require new motherboards aswell, one of them is the absolutely insane Asus ROG Dominus Extreme. Features TWELVE memory slots, twin 24 pin power connectors and a host of other features. Thanks for reading! Let us know your thoughts below! Thanks for this thread. Was waiting for a long time. Wait - so both Intel and AMD have X399 motherboards? That's not going to get confusing or anything. Looks like I'm going to have to call this round in favor of Intel. Intel, using shear horsepower and ring bus, probably beats their AMD counterparts even in multi-threaded workloads even though AMD has more cores/treads. Heavily threaded may still go to AMD but my guess is it'll be close there too. Can't wait for comparisons to see how it works out. Looks like we will start trading blows with each release. Should get good now! I think it should be the R7 1700X on the list, not the 1700 though. That's seems to be a better comparison on price and performance. That must be a typo in the OP because I'm reading it again and it says X399. And how sure is the release date? I read October 4th? I've seen Oct. 5 everywhere, haven't seen the 4th listed. "Specifically I am talking about Kaby Lake-X, the Core i5 7640X and Core i7 7740X which are on the X399"
Yep. Not the only one, as a matter of fact. Probably because 1700 is more value as it comes cheaper with equal potential when OCed. "This bit of new information regarding Z390 motherboards has been revealed by a leaked roadmap that has found its way to the internet. Furthermore, only the high-end Z370 chipset motherboards will be released this year and you will have to wait for the cheaper CPUs and motherboards to come out next year." Ah, sorry, yes. The 5th of Oct 2017. Yeap, sorry peoples...fixed that typo. Wonder what z390 will bring over z370. From my understanding, mainstream 8C/16T CPUs. A leak seems to confirm as much. AMD seems to have lite a fire under a giant. About time we start to see competition and performance come back to the market. I wish Intel would stop the new chipset every/everyother CPU launch game but they have been banging that drum for as long as I can remember. I'm curious as to what AMD will fireback with when Cannonlake/icelake (whatever it's gona be for x390) does appear with those 8/16 core CPUs. Well, right now we expect 12nm, which looks like a 14nm+ refresh. 15% more density(transistors), and >10% performance. More transistors means better IPC. Based on there 14nm frequency restrictions hard to say how much clock speed will raise until we know more about the improvements. Beyond that we have 7nm(1h 2019), which is what we hope is going to be a great node that offers >40% performance or >60% power reduction over the current 14nm Zen. TSMC is releasing 7nm this year, and is similar to Intel's 10nm. Samsung is an early adopter of EUV, and has the most aggressive node map, and at some point may play a roll in all this with 7n 2018, 6-5nm 2019, and 4nm 2020. AMD is tied to GlobalFoundries, but at an expense can move to another foundry until the contract ends in 2020. Rumor of AMD involvement with helping create A.I. for Tesla coincide with the choice of GlobalFoundries 12nm, which from a consumer desktop CPU vantage point doesn't look all that great compared to Intel's offerings. Never the less it's an exciting time for technology, and I can't wait to see how it unfolds. GlobalFoundries unveils 12nm finFET process; foundries jockey for position on way to next full node. GlobalFoundries uncorked a 12nm finFET process, which the company said will provide a 15% increase in density and more than 10% improvement in performance over the foundry’s existing 14nm process. This is GlobalFoundries’ second 12nm process. It announced a 12nm FD-SOI process called 12FDX last September, although it first mentioned a 12nm process back in July of last year. The announcement adds to the flood of process node numbers in semiconductor manufacturing these days. The reasoning behind all of this activity is that even though 7nm—the next full node—will be introduced next year, it will take time before that process is mature enough for commercial production. Foundries are trying to provide enough options to hold onto existing customers until that happens, while also tapping potential customers in new markets. The new business involves sectors such as automotive, IoT, communications infrastructure, and artificial intelligence/machine learning. GlobalFoundries, for example, is taking aim at the automotive and RF/analog markets with its new process. The 12LP process is expected to meet Automotive Grade 2 qualification next quarter, which under AEC-Q100 means it will operate at temperatures between -40°C and +105°C, and it is being targeted for transceivers in 6GHz wireless networks. He noted that shipments are expected to begin in the first half of next year. Still, there are now so many process node numbers out there that it’s becoming difficult to sort through them all, a task made all the more difficult because the numbers don’t match up from one foundry to the next. Intel’s 14nm process, for example, has double the number of transistors as TSMC’s 16nm, while Intel’s 10nm process is roughly the same as TSMC’s forthcoming 7nm. Joanne Itow, managing director for manufacturing at Semico Research, said foundry customers have to do their homework to make sense of all of this. “You have to do a lot of analysis of what process works with your products,” she said, noting that each foundry appears to be taking a base process and then proliferating it. She described GlobalFoundries move as a small tweak that gives customers new options. And there is certainly plenty of node tweaking underway. TSMC unveiled a 12nm process this month, while Samsung introduced an 11nm process. In addition, Samsung announced 8nm, 7nm, 6nm, 5nm, and 4nm finFET processes in May, and said it plans to introduce 18nm FD-SOI in 2019. Several of the new chips are more expensive than the parts they replace. The Core i7-7700K launched at $305; the new Core i7-8700K is $359. The Core i7-7700 had a launch price of $272, and the new core is $303. The Core i5-7600K was $217; the Core i5-8600K is $257. In short, you may be getting more cores, but you’re definitely paying for them. This is what the chart would look like with current Ryzen prices. Note that I did not round up to the nearest dollar. The Ryzen 1600@$195.89 still offers the better value compared to the 1600X, and comes with a CPU cooler. And would match up against the Core i5-8600K@$257, and be just above the Core i5-8400@$182. Well, right now we expect 12nm(~2h 2018), which looks like a 14nm+ refresh. 15% more density(transistors), and >10% performance. More transistors means better IPC. Based on there 14nm frequency restrictions hard to say how much clock speed will raise until we know more about the improvements. Beyond that we have 7nm(1h 2019), which is what we hope is going to be a great node that offers >40% performance or >60% power reduction over the current 14nm Zen. TSMC is releasing 7nm this year, and is similar to Intel's 10nm. Samsung is an early adopter of EUV, and has the most aggressive node map, and at some point may play a roll in all this with 7n 2018, 6-5nm 2019, and 4nm 2020. AMD is tied to GlobalFoundries, but at an expense can move to another foundry until the contract ends in 2020. Rumor of AMD involvement with helping create A.I. for Tesla coincide with the choice of GlobalFoundries 12nm, which from a consumer desktop CPU vantage point doesn't look all that great compared to Intel's offerings. Never the less it's an exciting time for technology, and I can't wait to see how it unfolds. The up to 15% more density and more than 10% performance marketing claims are using TSMC 16nm as baseline,. Glofo doesn't use its current 14nm node as baseline, because the increases that 12LP bring are minimal. 12LP is a marketing name. AMD will be lucky if gets 5% higher clocks with Pinnacle Ridge. The IPC is the same. Pinnacle Ridge has the same IPC than Summit Ridge. Only clocks change. 7nm Glofo is expected in 2019, but there is no confirmation it is coming int he first half. The claims of >40% performance or >60% power reduction over the current 14nm Zen are idealized claims based in a single-transistor measurement at optimal points. Real-life improvements will be smaller. AMD products will get only a fraction of those percentages. For 2018/2019 AMD will still rely on 4-core APUs with Zen. Question Max RAM speed for intel fore i5-9400f? AMD alternative to Gigabyte Z390UD with Intel Core i9-9900K Coffee Lake 5.0 GHz?